A collection of blogs from previous years about health, fitness, lifestyle and being a mum. 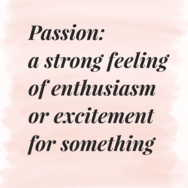 Aug 18, 2016 - What are you passionate about? 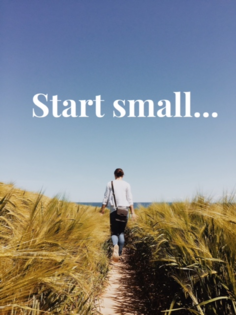 When I first started to think about quitting my old job I kept talking myself out of it. What a silly idea? Why did I spend all those years studying to give it all up now? But the thought just wouldn’t get out of my head. I would wake up in the night (normally with the help of my youngest) and not be able to get back to sleep again because I was thinking about it. Friends and family were a little shocked at first and probably thought it was a passing phase brought on by ‘baby brain’. But the more I talked about it, the more they got behind me and I started to realise it was a real possibility. So after weeks of thinking, planning, calculating, assessing, analysing, doubting and finally believing, I took the plunge. And I can easily say it was the best decision. I love my job! The main reason I love my job is because I am passionate about what I do. Yes, it is a lot harder than I thought it was going to be (who knew I had to become a whizz at website design too?!). But I now spend my working day helping people feel better about themselves, watch them get fitter, healthier and stronger. And most rewarding of all is the emotional change I see in people when they start to see and feel the results of their hard work. They start to believe in themselves. All they needed was a little guidance, support and motivation and they made the change they wanted to make. Who would have thought a year ago that I would be here today with 2 articles published in the national press, that the legend Daley Thompson would have tweeted me his encouragement on my new venture, and that I would have received some fantastic testimonials from my amazing clients? Just goes to show how far you can go when you combine hard work, determination and a real sense of passion for what you do. Aug 9, 2016 - Have you ever heard of diastasis recti? Have you ever heard of diastasis recti? Don’t worry if you haven’t. Many mums have never heard of this term and speaking from my own experience it was never mentioned to me by doctors or midwives after having my two. Diastasis Recti is a separation of the abdominal wall muscles and connective tissues usually brought about by your growing baby bump. Some women never know they have it but often wonder why their mummy tummy hasn’t quite gone back to how it was despite lots of exercise. Diastasis Recti can leave you with a sticky out tummy, a weak core, back pain and poor functioning pelvic floor muscles. All of which aren’t great when you want to get back to feeling like yourself again after having a baby. The good news is that you can fix it through the right nutrition, hydration and exercise. 1. Water, water, water – in order for all the connective tissue in your tummy to heal itself it needs water. Try to increase the amount of water you are currently drinking to help all those cells to regenerate and repair. 2. Ensure you are getting enough healthy protein in your diet. Your muscles and connective tissues desperately need protein to repair so give them a helping hand. 3. Don’t let poor posture impede your recovery. How are you sitting/standing right now whilst reading this? Are you hunched over? Is your back curved? How do you sit when you are breastfeeding? All of this can have a direct impact on your recovery. If you have any questions on this or your post natal fitness journey then please get in touch. 1. Be mindful of portion size. Depending on where you go portion sizes can vary significantly. Our large can often be their small! Ask for a side plate so you can portion some off before you dig in. That way you can still finish your plate! 2. Try to limit bread to just one meal time. You can still order the burger (it is a holiday after all) but leave the bun if you have already had bread that day. And try to avoid the bread they may bring you before you start your meal. 3. Try swapping fries for an extra portion of veg with your meal or a salad. 4. If you go for the salad, ask for the dressing on the side so you can manage how much you have. 5. Always keep a water bottle with you. It will help you keep hydrated in the heat and you will be less likely to reach for those thirst quenching sugary drinks as much. 6. Enjoy your treats. It is a holiday after all so allow yourself to have a few treats now and then. Try swapping ice cream for frozen yogurt or sorbet so you still feel like you are getting a treat. 7. Most of all have fun and don’t stress if you indulge now and then. Just try to be as balanced as you can. May 11, 2016 - Are you getting enough exercise? We all know that we should be moving more than we are sitting during the day. But there is a big difference between knowing it and doing it. Current guidelines say that we should be doing a minimum of 150 minutes of moderate activity over the course of a week plus some sort of strength training 2 days a week. When you factor in a demanding job, kids, house stuff and trying to have some sort of social life, exercise if often the last thing on our minds. So why not combine it with one of those other priorities to reach that goal? For example, take the kids cycling or swimming (you have to join in too or it doesn’t count! ), go for a brisk walk round the park with your friends instead of sitting in a coffee shop, squeeze in a fitness class at lunch time instead of having lunch at your desk. You need to look after your body - it is the only one you will get! So keep it healthy and move more. 1. 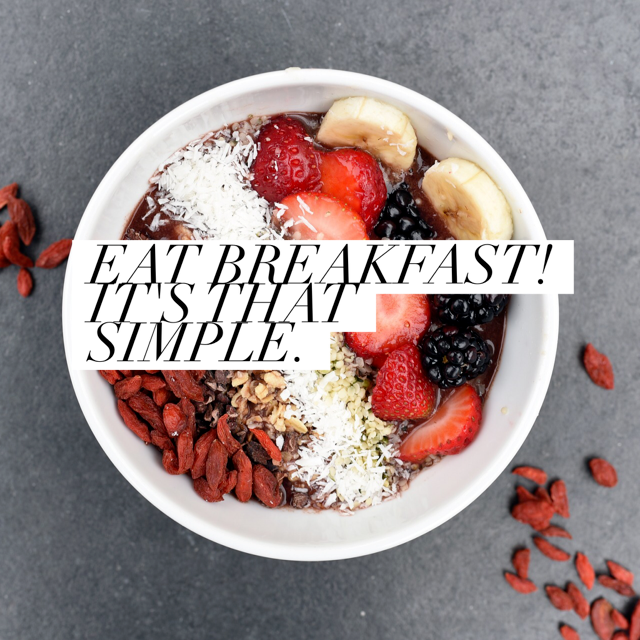 If you are looking to lose a little weight, skipping breakfast could actually mean that you end up consuming more calories over the day and putting weight on. If you haven’t eaten since the night before, by mid-morning you will be starving and are more likely to reach for that sugary snack to keep you going till lunch. 2. People who eat breakfast tend to make healthier food choices during the day and eat more fruits and vegetables than those who don’t. 3. Having breakfast can help improve your concentration. It is easy to underestimate the effect hunger has on your productivity, concentration and mood at work. Have a healthy breakfast and get more done! Simple. 4. Eating breakfast could actually save you money! By having a healthy breakfast at home you are less likely to stop on your way into work to buy a muffin and latte. Think how much you’ll save!So stop hitting that snooze button and get yourself out of bed so you can enjoy a nice healthy breakfast. You will feel better, work smarter and get more done! It still doesn’t feel real, but I can now say I have run the London Marathon. On Sunday I lined up with 39,000 other people and ran 26.2 miles around the beautiful city of London. I have no problems with saying it was very hard. It was. 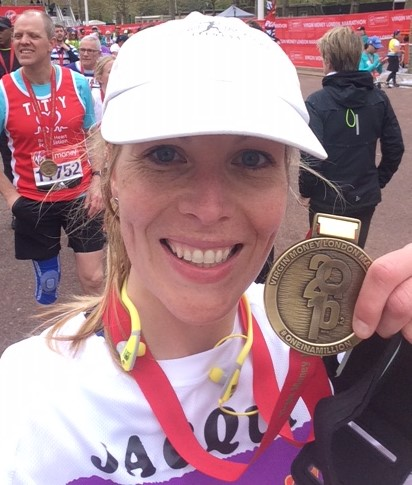 But surprisingly, it wasn’t as hard as I had thought it would be – simply because the atmosphere and the cheering crowds helped take my mind off my aching legs and kept me going. I had no idea how emotional I would feel running the marathon, but I crossed the finish line almost in tears. I did it! And I have raised almost £1000 for Get Kids Going. So a huge thank you to everyone who supported me, sponsored me and cheered me on. I couldn’t have done it without everyone’s support. If any of you feel just a little bit inspired, then I say go for it. You never know what you can achieve unless you give it a go! 1. Take time to plan your training schedule and be realistic. If you don’t have time to do 4 runs a week then plan for 3. Unless you are going for a specific time, the main point about training is time on the legs, i.e. getting your legs used to running for hours at a time. 2. Make sure you plan and stick to rest days. Your body needs time to recover. Over training often leads to injury. 3. Nutrition is critical. Use your training time to figure out what nutrition and hydration works for you – before, during and after running. Before: I recommend waiting 1.5 – 2 hours after eating before going for a long run but obviously it depends on what and how much you eat. During: Practice drinking and eating during your run. You need to know what works for you and how your stomach feels afterwards. There are so many different gels and energy foods out there to try. The same goes for energy drinks and water. After: You should eat a combination of carb/protein based foods 30 - 60 minutes after a long run to help recover. 4. Always include a cool down after a long run. Keep walking when you finish. This keeps the blood flowing to your legs and helps your muscles recover quicker. 5. Don’t change anything or try anything new the week leading up to the marathon or on the day – this includes kit, food and drink. The week before I ran London I went for a run in different socks. The result – a nice big blister. Stick to what you know works at this point. 6. On race day - Having your friends and family at certain points on the route to cheer you on helps more than you realise. You get such a boost seeing them cheer and clap, plus I found that you are so distracted by trying to spot them in the crowd you forget you are running! 7. You know by now what will keep you motivated on the day – so use everything you have to keep yourself going. My playlist was mostly cheesy 90s dance tunes which definitely worked for me! I also ticked off all the big land marks along the route and just tried to focus on getting to the next mile marker. 8. Pace yourself. It is very easy to get carried along with all the other runners and go off too quick. Run your own race. Yes you will probably get overtaken early on but you will probably pass those same people a few miles ahead when they have tired and realised they went off too quick. This takes practice! 9. Make a plan for the finish. Once you have crossed the line and got your medal the only thing you will want to do is get home and rest. Plan your route home whether it’s by car, train, bus or piggy back! That way you won’t waste time or energy figuring it out when you have just run 26.2 miles! 10. Enjoy it! Soak up the atmosphere. When your legs are tired – remind yourself why you are running. Smile, wave to the crowd, cheer on your fellow runners – but most of all, enjoy it! 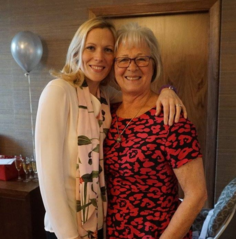 Ok - so I learnt a lot more than 5 things from my Mum. The list is endless but I wanted to note down my top 5 to pass on to all those other new mums out there. 1. Celebrate everything you achieve right now. Whether it’s managing to get your little one to sleep at lunch time or remembering to do your pelvic floor exercises (oh yes! ), every little victory is still a victory. You need to congratulate yourself on the little things because they all add up to the big things. Doing your pelvic floor exercises now means you can enjoy the trampoline outside in the summer time! I don’t mean you need to be going to a HIIT class 3 months after giving birth but it is important for your body and mind to exercise. A walk around the park with a friend, a new mum’s fitness class, a bike ride with the family, or just stick on your best cheesy music and have a dance around your house. If you don’t feel like you have recovered properly after giving birth or are still experiencing some pain then trust your instincts and go back to the GP. That is what they are there for. If you don’t feel like they have listened to you properly then ask to see someone else. 4. Rest when you can. Yes, that pile of washing, ironing or dishes can wait. When your child is sleeping, you need to rest. That lovely feeling of "guilt" will show its head at this point because you feel there is so much to do and not enough time. So ask yourself this “What’s more important; clean clothes folded neatly or a well rested (!) mum?” This took me a long time to master and I still don’t always manage it - but when I do I feel so much better for it. 5. Stop comparing yourself to every other mum out there. Your body has spent 9 months growing another human being, you have just gone through child birth and you are now experiencing sleep deprivation on a scale which surely must be against your human rights! Give yourself a break. Just because your friend’s child is sleeping 5 hours a night and yours isn’t, doesn’t mean you are doing anything wrong. Every child is different - the sleep does come eventually. And don’t beat yourself up because it’s taking time to get into your old jeans. Eat clean, drink lots of water and find some kind of exercise that you enjoy and will support you during this recovery period. What’s wrong with slow and steady? The magazines and papers these days want you to do everything in the shortest amount of time possible: Lose 10lbs in 10 days, get that bikini body in 4 weeks...(whatever a bikini body is supposed to be)! Personally I believe this takes all the enjoyment out of eating healthily and exercising. I completely understand people want results - I am one of those people. But why does it need to be so quick? You may find you get the results quickly if you can stick to it (which is hard enough) but the results more often than not don’t last. The cycle then starts again - you feel rubbish, reach for the biscuits and stop exercising. If you want to feel good and look good all year, then think about the direction you are going in and not how fast you are travelling. Start small by making healthier choices when it comes to snack times - swap your morning biscuit for an apple or some nuts. And start being more active - take the dog, kids, other half for a walk. All the little changes you make will add up and you will start to feel fitter and stronger - and the best thing is that it’s more likely to last! 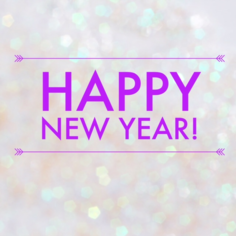 Is getting fit or losing weight one of your new year’s resolutions? If so, by turning this into a SMART goal you are more likely to succeed. SMART stands for Specific, Measurable, Achievable, Realistic and Time-bound. 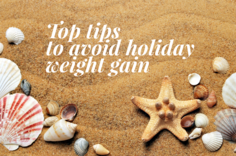 So instead of saying you want to get fit or lose weight for your summer holiday - why not spend a little time thinking about how you could turn your resolution into a SMART goal. For example, you could turn “I want to get fit” into “I want to run a 5k park run by the end of February”. Try not to make the goals too far in the future as you may lose a little motivation, or you could have goals for every month to keep the challenge going. Also try writing them down and putting it somewhere you will see every day, i.e. fridge, mirror, etc. If you’re not sure where to start - give me a call/email, always happy to help.